Challenging the long-cherished notion of legal objectivity in the United States, Carl Gutiérrez-Jones argues that Chicano history has been consistently shaped by racially biased, combative legal interactions. Rethinking the Borderlands is an insightful and provocative exploration of the ways Chicano and Chicana artists, writers, musicians, and filmmakers engage this history in order to resist the disenfranchising effects of legal institutions, including the prison and the court. 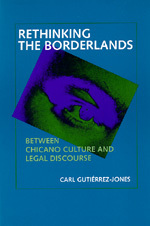 Gutiérrez-Jones examines the process by which Chicanos have become associated with criminality in both our legal institutions and our mainstream popular culture and thereby offers a new way of understanding minority social experience. Drawing on gender studies and psychoanalysis, as well as critical legal and race studies, Gutiérrez-Jones's approach to the law and legal discourse reveals the high stakes involved when concepts of social justice are fought out in the home, in the workplace and in the streets. Carl Gutiérrez-Jones is Associate Professor of English at the University of California, Santa Barbara.